Every year, one color is the star of the show when it comes to kitchen decorations. From widely-expected ones like orange and yellow to less frequent shades of pink or green, every part of the color spectrum gave at least one major trend when it comes to one of the most important rooms in the house. This year, we see a rise for one of the less-used colors of the decade: versatile, easygoing, simple blue. But just because we’ve found the dominant color doesn’t mean we have any idea on how many varieties we’ll see across the year. 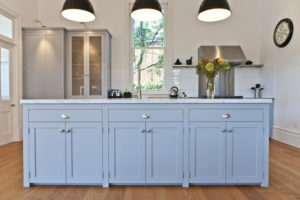 There are lots of shades of blue when it comes to kitchen décor. 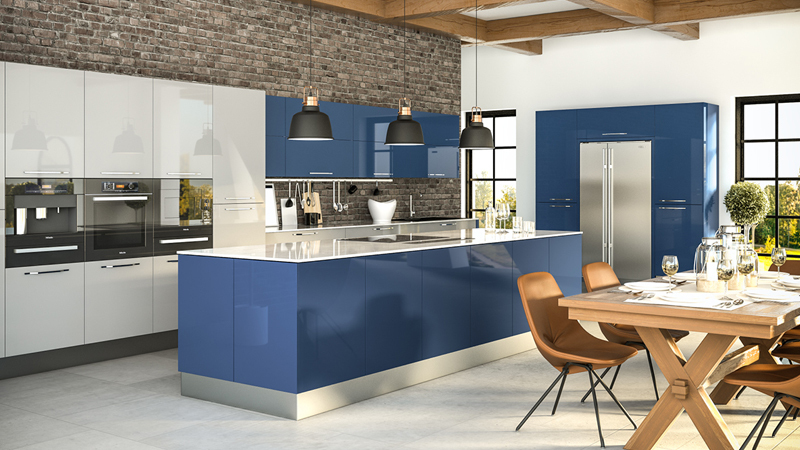 For example, striking blue is one of the most common tone we’ve seen last years – bringing a much-needed contrast to every kitchen and working extremely well with either white or earthier tones for countertops and appliances. There are so many more, though! Tanzanite has a touch of violet in in, aqua fresco is, like its name suggests, greener, while blue chalk is (in our opinion) the tone of the year so far. It’s tame, chill and even has a little bit of warmth to it. 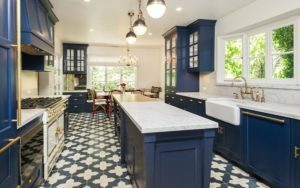 Catalina coast blue is another one of 2018’s favorites, for the sole reason of being more of a gray than a blue but working so well with this year’s darker trend. And to think that we’ve only discussed a few of the more famous shades. We could think of at least a few dozens more, all while steering away from the classic sky blue or navy. Although 2018 is all about the blues, the final colors don’t look much like what we’ve seen before. Each one has a new twist, a new accent or a new feeling that we haven’t quite felt before, which can only be a good thing. We’re looking forward to seeing a wealth of blues everywhere this year, from local kitchens to global cafes.